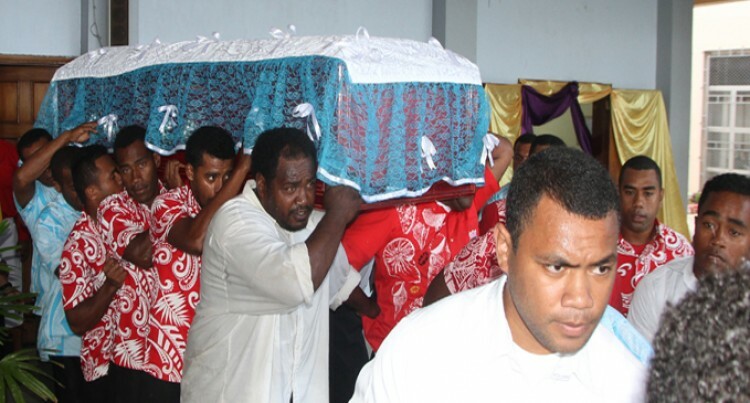 Relatives and Red Rock players carry the casket of their head coach Lote Rasiga during funeral service yesterdy. Photo: RONALD KUMAR. Red Rock rugby sevens club founder and head coach Lote Rasiga was finally laid to rest in Suva yesterday. Speaking to SUNsports yesterday former Red Rock and Vodafone Fijian Bati winger Lagilagi Golea said it was sad moment for them to farewell Rasiga who had been instrumental in developing them to become better players. “Even some of our brothers who are now playing in France flew into the country to farewell our coach, mentor and for most of us Lote was like our dad. He will definitely be missed,” an emotional Lagilagi said. A church service to commemorate the life of Rasiga was held at the Suva Civic Centre where New Methodist Christian Fellowship general superintendent, Atunaia Vulaono delivered a moving sermon. Rasiga was also the church senior pastor. Former Flying Fijian prop Paula Biu said, Rasiga gave a lot including his wealth when it comes to nurturing of players. Son, Lote Rasiga Junior described his dad as a ‘tough guy’ who was committed to his business, rugby and church. Over the years players who have excelled in sevens and rugby league under Rasiga’s guidance were Crusaders winger Jone Macilai, Olympic Games gold medallist Jasa Veremalua, Sireli Bobo (now playing in France), Niumaia Cakacaka, Aporosa Daunivucu, Suli Wainivanua, Timoci Matanavou (now playing for Toulouse), Lepani Nabuliwaqa, Jone Vota, Peni Daunimeke, Ponipate Kato, Manasa Bola, Sirilo Dasi, Manoa Qerea, Luke Waikamakama (playing in US), Venasio Komai (now coaching in Dubai), Eroni Sau, Roger Qoro and the list goes on. Rasiga is survived by his wife, five children and four grand children.